There was just a pair of earthquakes near the Gorda rise. There was first an earthquake of magnitude M = 5.0, followed by a M = 4.9. The 5.0 appears to be within the GP, but the 4.9 seems to be at the eastern boundary of the ridge. These two earthquakes do not pose a tsunami risk for northern California (or elsewhere). Nor do they likely have an affect upon the likelihood of a Cascadia subduction zone earthquake. 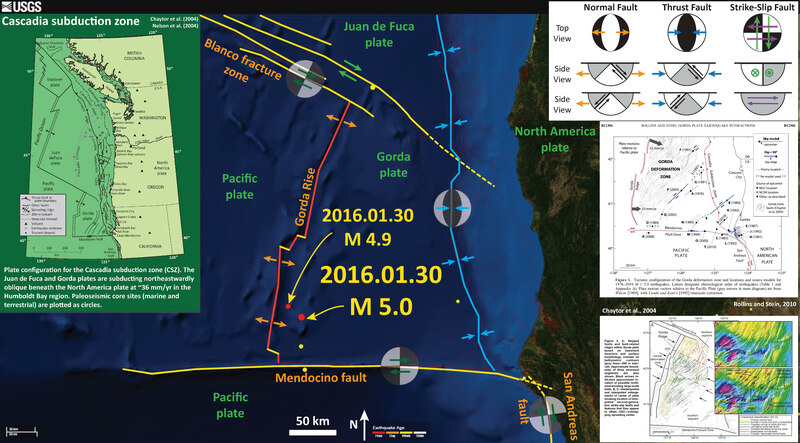 The USGS has prepared a moment tensor for the M 5.0 earthquake. I have updated the map. It is clear now that this is an extensional (normal) earthquake. I include an updated map below the original map. Below is an interpretive map showing these two earthquakes as red circles, as well as other seismicity for the past week. 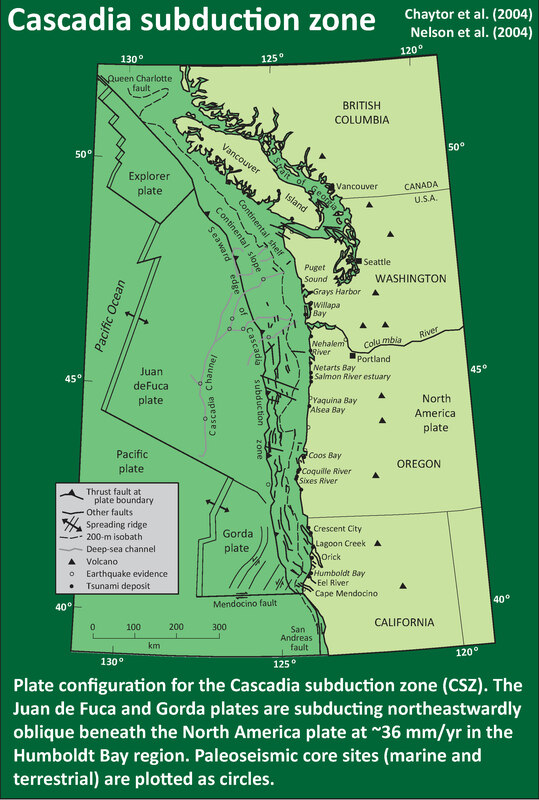 I include an inset map of the Cascadia subduction zone (after Chaytor et al., 2004; Nelson et al., 2004), an inset map from Chaytor et al. (2004), and from Rollins and Stein (2010). I explain these inset maps below. 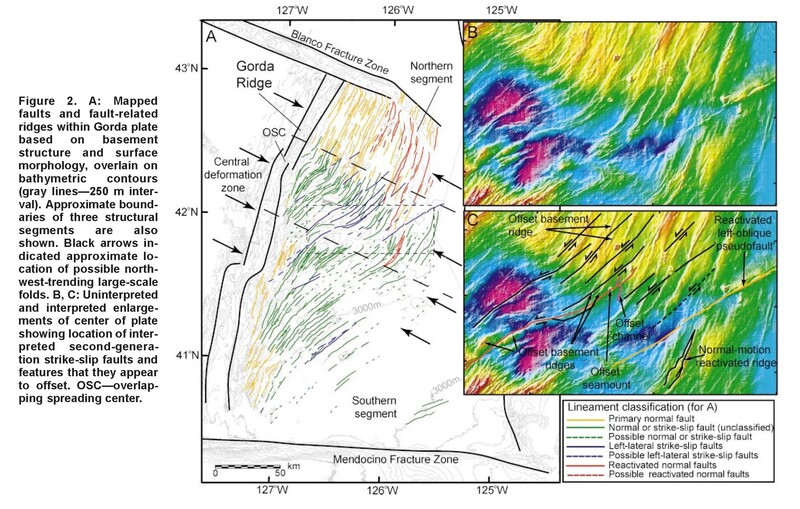 I include labels for the plate boundary fault systems in the region and include generic focal mechanisms for these fault systems. There is a legend that shows how moment tensors can be interpreted. Moment tensors are graphical solutions of seismic data that show two possible fault plane solutions. One must use local tectonics, along with other data, to be able to interpret which of the two possible solutions is correct. The legend shows how these two solutions are oriented for each example (Normal/Extensional, Thrust/Compressional, and Strike-Slip/Shear). There is more about moment tensors and focal mechanisms at the USGS. Based on the locations of these earthquakes, along with our knowledge of the local tectonics, I interpret the M 5.0 to possibly be a northeast striking left-lateral strike-slip fault earthquake. The M 4.9 could either be like that, or be an extensional earthquake (like the 2014.03.13 earthquake listed below). I summarized the regional tectonics of the Cascadia subduction zone recently here. 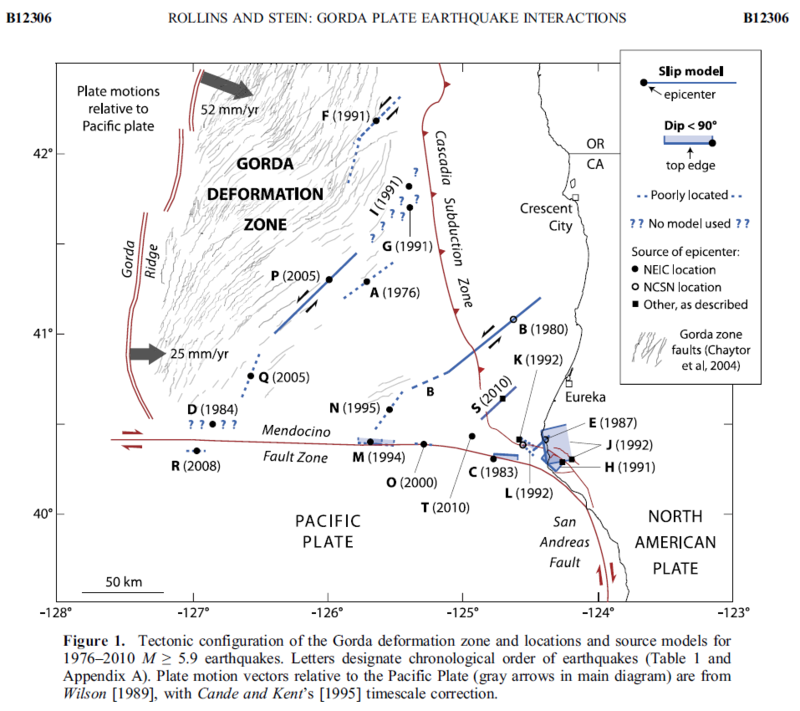 The M 5.0 earthquake is similar to the earthquake “P” on the Rollins and Stein (2010) map. Here is the updated map. Note the extensional moment tensor. This is aligned nicely with the ridges from the Gorda rise (which are visible in the large scale map at the bottom of this page. There was an earthquake along the Gorda rise in 2014, much to the north of these two earthquakes. Here is my earthquake report for that 2014.03.13 M 5.2 earthquake. Here is a large scale map of the region for these two earthquakes. This is taken from Google Earth. The two largest orange circles (color represents depth < 33 km) are the M 5.0 and M 4.9, with diameter representing magnitude. 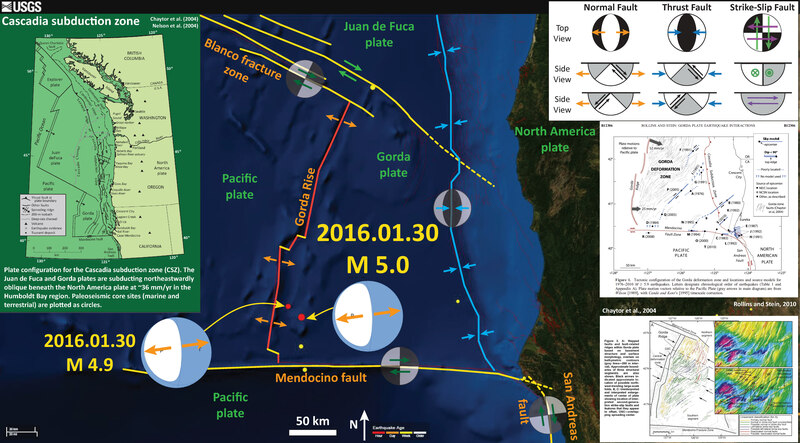 The M 5.0 is clearly in the region where there are north-northeast striking faults.